Wood Activated Carbon Market size was estimated over USD 230 million in 2016 and the industry will grow by a CAGR more than 10% up to 2024. Rising world population is one of the key factors for industrial expansion and increase in agricultural activities. These activities demand clean and portable water for use, resulting in a rising need of water treatment. Water treatment plants are required to maintain the groundwater level and to meet the growing demand for water, hence boosting the wood activated carbon market in coming years. This is due to the extensive product usage for purification, filtration, removal of organic chemicals, odor & taste control driven by high porosity, gas and liquid phase adsorption, and other superior features. Availability of substitute products along with stringent regulation regarding deforestation are the key restraining factors for market growth by 2024. Significant usage of petroleum pitch, coconut shell, jute sticks, saw dust, lignite, and other organic products for the production of activated carbon will restrict the usage of wood based product in the market. 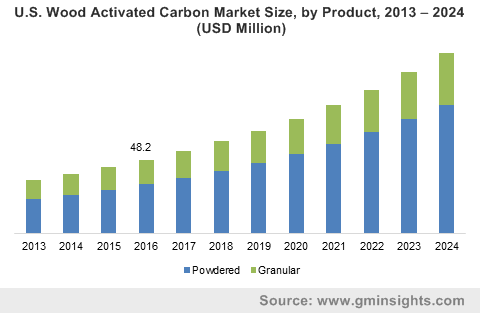 Wood activated carbon market is segmented into powdered and granular products. Among these, powdered product was valued at more than USD 150 million to seize approximately 60% of the overall industry share in 2016. Both forms are used to control the odor & taste and organic chemicals removal in water treatment & air purification industries and also for decolorization of edible products, medicines, etc. The powdered form is comparatively less expensive than granular due to the abundant availability and low production cost. This, in turn, will strengthen the powdered wood activated carbon industry penetration in forecast period. Fluid adsorption dominated the overall wood activated carbon industry with more than 30% of the revenue share in 2016 and will witness growth at a significant rate throughout the forecast period. Wood activated carbon is widely used in air and water industries for adsorption of any kind of fluid, thus enabling air and water treatment owing to its superior adsorption characteristics. Growth in manufacturing sectors coupled with increasing demand for water treatment throughout the world will create a healthy demand for wood activated market over the period of 2017 to 2024. Decolorization and purification are the fast-growing application segments in wood activated carbon market and will expand significantly by 2024. The substantial use of the product at the time of food processing for purification of liquid food items including wine and other alcoholic and non-alcoholic beverages, decolorization of edible oil, food stuffs, etc. owing to its high purity, macro porosity, deodorization and other specialty features will have a positive influence on the market demand in coming years. Air and water are the dominant end-user industries accounting for over 60% of the total share and will grow at a substantial rate. The product is widely used for the purification, adsorption, recycling of polluted air, gas and water treatment due to its high adsorption capacity, strength & ignition point, effective pore size, and faster filtration rate. Food & beverage industry accounted for more than USD 30 million for wood activated carbon market in 2016. The product finds its usage for decolorization and purification of fruit juices, food products, starches, edible oil, beverages, sweeteners, etc. Rapid expansion of food & beverage sector in developing economies will positively influence the wood activate carbon market demand by 2024. 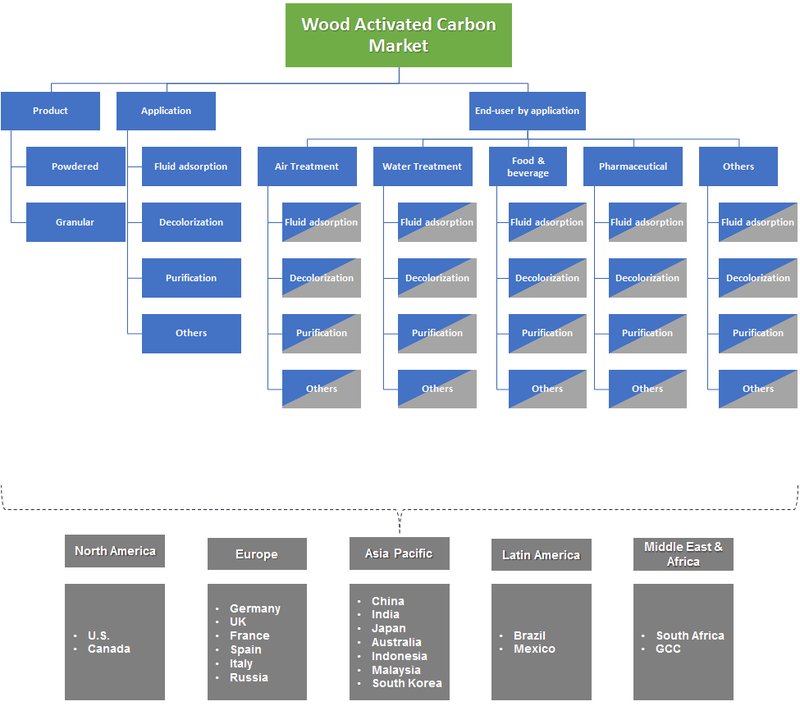 Asia Pacific wood activated carbon market, driven by the pharmaceuticals, water treatment, and manufacturing bases in regional developing countries, will hold sway the global industry throughout the forecast spell. In 2016, the regional market was valued over USD 80 million and will have a significant growth rate in coming years. Increasing need for water treatment plants in the industrial sectors of China and India with rapidly growing textile and automotive industries will positively influence the product demand in coming years. Collectively, Europe and North America had a market share of over 45% of the overall wood activated in 2016 and will lose their shares to the Latin America and Asia Pacific. This can be attributed to the shift in global manufacturing units towards these economies driven by the low production cost, availability of raw material and lenient government regulations. Haycarb., D&R Corporation, Jacobi Carbons, Ingevity, Kalpaka Chemicals, Chemtex Speciality, Induceramic, Acuro Organics Ltd, Adsorbent Carbons Private Ltd., Osaka Gas Chemicals Co. Ltd, Fujian Zhixing Activated Carbon, Zhejiang Xingda Activated Carbon, Kuraray are the key industry players. Ingevity Corporation, Haycarb, and Kuraray hold significant shares in wood activated carbon market. The companies also participated in different merger, acquisition and expansion activities to expand their production capacities and global reach. For an instance, in September 2017, Calgon Carbon Corporation was acquired by Kuraray and this strategy will further enhance the company’s position and its product portfolio across the globe. Continuous growth in food & beverage, water and air treatment industry will boost the wood activated carbon industry in the forecast timeframe. This is due to the extensive usage of the product for filtration, adsorption, decolorization, recycling and purification in waste water & manufacturing industries, food & beverage and pharmaceutical sector. Moreover, production expansion in regions such as Latin America and Asia pacific will bolster the wood activated market growth in future.